We were on BBC 3 counties Friday afternoon with the Director of Public Health at Herts County Council talking about HIV testing, why the County Council wont fund the Crescent and also why Herts Aid don’t provide the service either, despite a huge amount of funding. You can listen again here http://www.bbc.co.uk/programmes/p02x6f74 we are on from 2hrs 20 mins the Roberto Perone Show 31st July on BBC 3 Counties Radio. BBC and ITV news yesterday covered the launch of a pilot postal HIV testing service for residents in Birmingham in “At Risk” communities only. We hope that Hertfordshire County Council takes note and implements quickly a similar programme to address the late diagnosis rates in Hertfordshire, particularly in West Herts, where rates are well above national average. Hertfordshire’s Director of Public Health Mr McManus, coincidentally was also a joint Director of Public Health in Birmingham, and so we hope he will follow the direction they have taken without further delay. We have been raising this issue for some two years, appealing to Mr McManus and Teresa Heritage, Herts County Council Cabinet member for Localism and Health, for funding for our postal service, but without success. Perhaps now there will be a change of direction, we certainly hope so! Our postal service is not restricted to at risk groups and is free for all residents of Hertfordshire and beyond. It is quick, totally confidential, and very easy to do, we will support you throughout the process too. 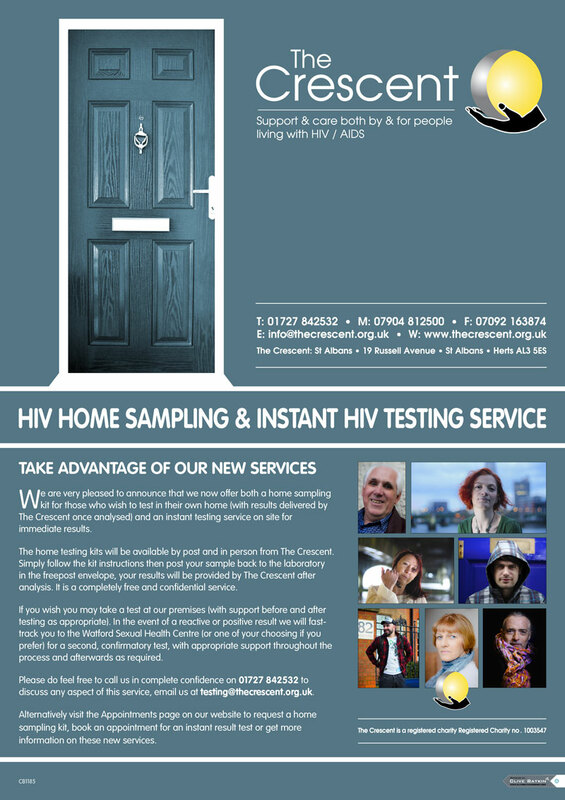 If you don’t want to test by post we do of course offer onsite instant result HIV testing by appointment. Contact us on Testing@thecrescent.org.uk, visit our website http://www.thecrescent.org.uk or call us on 01727 842532 to order a kit or find out more about the service. 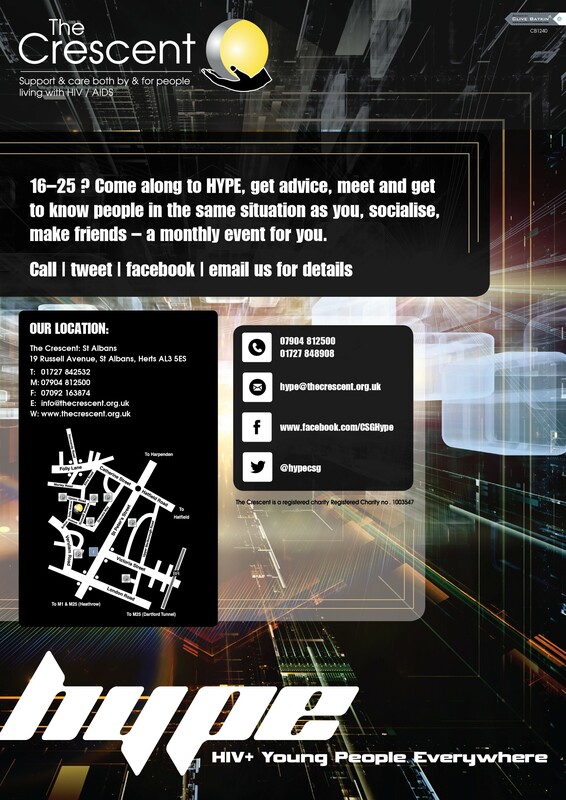 Next events for our young persons group, HYPE are on 25th July and 22nd August from 2.30 to 5.30. 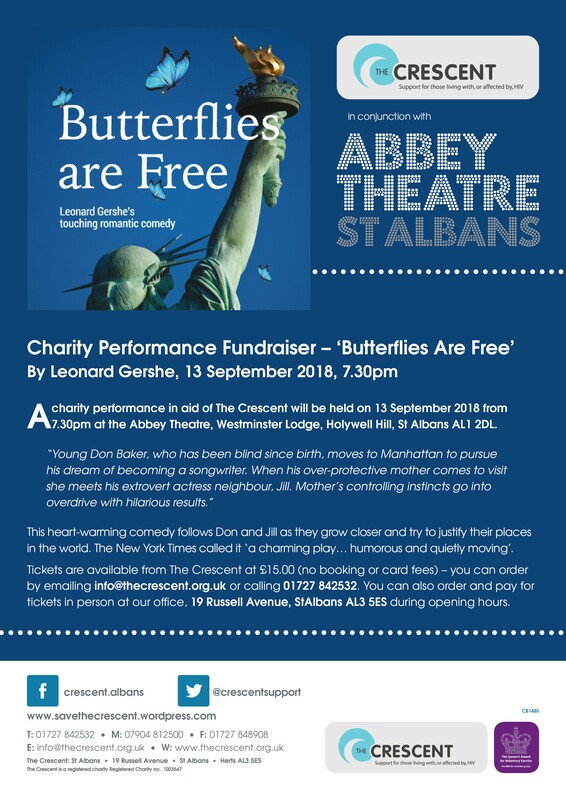 If you are 16- 25 and living with or affected by HIV come along, meet other people in your situation, get support, have fun and relax in a safe environment at the Crescent in St Albans. HYPE is a group run both by and for young people living with HIV, currently meeting once a month at the Crescent, 19 Russell Avenue St Albans AL3 5ES. You will be able to suggest activities you would like to do, play games, watch TV, make friends, get advice, share ideas and hopefully have fun along the way. All free and completely confidential, we look forward to seeing you soon! 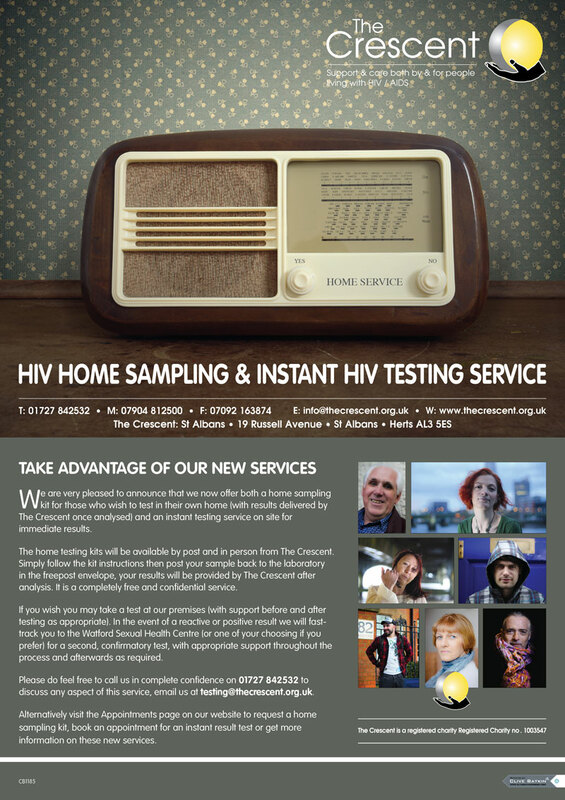 See here for details of our instant result and postal home sampling HIV testing services – another free service from the Crescent. Email testing@thecrescent.org.uk or see http://www.thecrescent.org.uk/index.php/testing/appointments/ for more details or make an appointment.